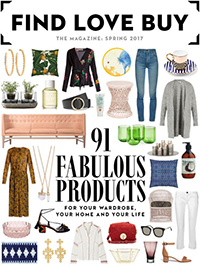 Find Love Buy is a shoppable magazine and website created to bring the best in global design, travel, lifestyle and fashion to Asia. Based in Hong Kong, we deliver regionally relevant and inspiring content with a carefully edited collection of products. We find it, you love it, you buy it. On Find Love Buy you will discover excellent shopping stories, inspiring homes, the latest in Asian travel and brilliant health and beauty features alongside insights into the lives of the region's most discerning tastemakers. We are dedicated to bringing you the best in shopping and lifestyle, from cult beauty buys to wonderful furniture trends, from new designers to the latest lifestyle must-haves. In our online boutique, you will find our handpicked selection of brands and products, all chosen with care and deliverable to you. Co-founded by Tamsin Bradshaw and Gemma Soames, two editors with a decade of experience in international publishing behind them, Find Love Buy is Asia's most exciting new shopping platform and must-read lifestyle publication. A leading design journalist who has written for the South China Morning Post, Hong Kong Tatler, Time, New Zealand House & Garden, and The Japan Times, Tamsin was until recently the editor of Hong Kong's Home Journal magazine. She was born and raised in Hong Kong, and she has also lived in Tokyo, Sydney and Shanghai. She is passionate about seeking out the very best in interiors and design from all over the world and bringing it home. With Find Love Buy, she is now able to do the same for all of you. Gemma is the former fashion features director at The Sunday Times in London, and she moved to Hong Kong in 2012, becoming a freelance journalist writing for Vogue, South China Morning Post, Porter Magazine, Architectural Digest and many others. She is also the Contributing Editor to Hong Kong Tatler. An extremely serious online shopper, she has made it her mission to bring the best in stylish and wearable fashion to her readers wherever and whenever they want it. Find Love Buy was created with just that in mind.